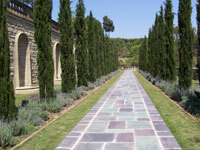 The Greystone Mansion is in Beverly Hills, and it is taken care of by the City of Beverly Hills Recreation and Parks people and the park rangers. They answer questions and help you find your way around. The grounds are like a big park, and our visit there was a wedding going on in one of the flower garden areas. The ranger said people rent the grounds for weddings and special parties. The mansion is huge and has towers. It looks like a castle and the front patio has an awesome view of Los Angeles. You can see the downtown buildings and Hollywood. We could not go in the mansion, but we looked through the windows and I could see a beautiful wooden staircase leading to what looked like the living room. I was told that the father, Mr. Doheny, went hunting on the property, and that the servants would clean the animals, and cook them for dinner. They had a special gun room, and a bowling alley in the basement. 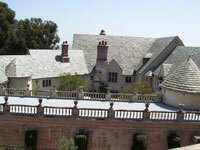 The Doheny's had children, and must it must have been fun living in Greystone mansion. My grandmother said they have a flower and garden gala at Greystone each year to raise money to take care of the mansion, and people can go inside the house for a tour. 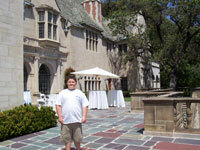 I would like to take that tour sometime, and hear all about the Doheny family. In the summer they have special camps for children, where they learn crafts and have fun playing games on the mansion grounds. They also have plays and a symphony performs in the big stone courtyard. If you would like to see a really nice mansion, and hear about the family who lived there, you should drive to Beverly Hills and see this historic house. There is no charge to walk around and look, and the rangers are nice. Thank you for reading Kids Kaleidoscope. Next month I will be telling you about some fun things to do in Santa Barbara during the summer.